Of course Google will also suggest other versions of the quote, like the ones below. Okay, so I wasn’t actually given any lemons and nor did I make lemonade, but I did buy five lemons to make a Tarte au citron. With Week 1 of my patisserie challenge almost over and no bake to show for it, I thought that I better get started, so last night, I made pâte sucrée for the base of my Tarte au citron. According to Will Torrent, pâte sucrée, which is used to make tarts ‘is similar to pâte sablée but the use of caster/granulated sugar instead of icing/confectioners’ sugar makes a less delicate pastry’. As the recipe suggested leaving the pâte sucrée in the fridge overnight to chill, I didn’t complete the bake until later this afternoon after we had completed an 8 mile off-road run. The next step of the bake was rolling out the pâte sucrée and lining a tart tin. Having recently worked with straight forward short-crust pastry, I had forgotten that pastry enriched with egg can be a little bit more difficult to work with. I struggled with the first roll (the pastry was more sticky than I think it should have been, possibly because I added vanilla extract rather than the seeds of a vanilla bean) so I ended up having to re-roll the pastry. Re-rolling is not the best as it can result in the pastry becoming too tough, but I really didn’t have an option as my pastry was sticking to my work bench, despite lightly flouring the surface. My re-roll resulted in a relatively well-lined tart tin, except for the fact that I really do need to get a new 25 cm tart tin. My tart tin is a cheap one that I got for our camper van. It has a lip/rim on it which means that when you try to cut off the excess pastry, it is difficult to get a neat edge. Alright, I know a poor work person blames his/her tools but I think I have a legitimate concern in this regard. The next step was to blind-bake the pastry. The recipe suggested that I should blind bake the pastry with baking paper/baking beans in it for 10 – 15 minutes at 180 degrees Celsius and then lower the oven to 160 degrees Celsius, remove the baking paper and beans and bake it for a further 5 to 10 minutes. Given the lip on my tart, I erred on the side of caution and blind baked my pastry for 10 minutes at 180 degrees Celsius and 5 minutes at 160 degrees Celsius. Needless to say, I was a bit too cautious as the base could have had at at least another 5 minutes. That being said the sides and the rim of the pastry was nicely cooked with a slightly nutty, caramelised flavour. And my husband says that despite my concern the pastry was not under-cooked. Although I may not have been entirely happy with my pastry, I have to say that the filling was cooked as it should have been. The recipe says ‘Pour the filling slowly and carefully into the tart case. Push the tart further into the oven , close the door, say a little prayer and bake for 30 to 40 minutes or until it just starts to set in the centre but still wobbles like a jelly’. Although I didn’t say a prayer, I did continue to watch the tart closely through the oven door (as the do on Great British Bake Off). I checked the tart after 30 minutes, again after 35 minutes and then finally lost my nerve and removed the tart from the oven after about 37.5 minutes. The result was a well cooked filling with the required wobble. The only thing that I would do differently next time (if there is a next time) is skim the lemon filling mixture more before pouring it into the tart case. My cooked tart had a few small, burst bubbles on the surface, which shouldn’t have been there. 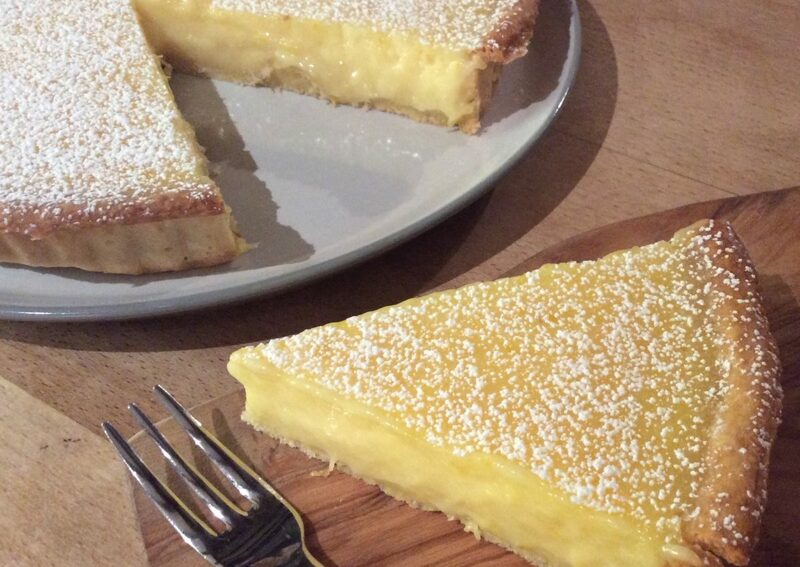 The perfect lemon tart has a smooth, glass-like surface. Thank goodness the recipe suggested finishing the tart with light sprinkling of icing sugar, which hid most of my multitude of tiny bubble ‘sins’. After allowing the tart to cool to room temperature, my husband and I tucked into a small slice. My husband was ecstatic, whereas I felt that it was a little too sweet and rich for my taste (9 eggs, 390g sugar, 275ml of double cream and the juice and zest of 5 lemons will no doubt do that). Despite my opinion, my husband says it has just the right balance of sweet and tart. After my husband squirreled away another piece of the tart to eat tomorrow, I took the rest of the tart up the road to our resident photographer so that he can try to works his magic on my bake and turn it into a piece of art in the form of a photograph. Given that my tart cracked slightly en route and the light sprinkling of icing sugar had dissipated somewhat from the surface of my tart by the time I delivered it to him, who knows whether he will be able to turn what may have become a sow’s ear into a silk purse. Thank goodness I took a photo of my bake earlier, before my walk in the dark partly-destroyed the aesthetics of my bake. Oh yes, and I should have used a warm knife to cut the tart so that I would have got a neater edge – what would my Chef Tutor say about my over-sight? And with all this, Week 1, my 1st bake and the first of my 52 challenges is complete. As in cookery school, I am sure there will be trials, tribulations and triumphs along the way. My very lovely colleague at work had an abundance of green tomatoes which he didn’t know what to do with, so he gave them to me. Intrigued by the idea of a green tomato cake, but inspired to make a green tomato pie, I searched the Internet for green tomato pies to see which one I liked best. After a bit of a search, I found a recipe by Roti n Rice ( www.rotinrice.com) for a green tomato pie which appealed to me even more than the one offered by The Spruce Eats. After trying one of the green tomatoes raw (it was quite bitter), I started to doubt my choice of recipe, but having already made the pastry, which was slightly sweetened with sugar, I thought I would persevere. I am glad that I did. 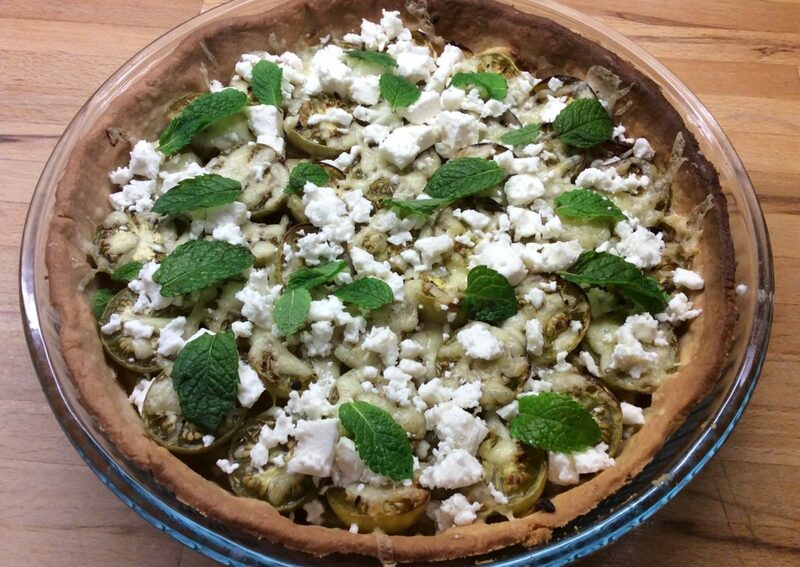 The tart, with layers of cheddar cheese, caramelised onions and green tomatoes, topped with herbs, feta and mint was absolutely delicious. It certainly did not feed the number it was intended to feed (eight) and we wolfed down half the tart in no time at all. Although the tart was delicious, there are two things I would do differently if (or when) I cook the tart again: (1) I would use a shallower tart tin as the ratio of filling to pastry was not quite right and (2) I would bake the pastry less as it was a little too brown, albeit that the colour of the pastry did not detract from the overall taste of the tart. Place plain flour, icing sugar, and cold salted butter into a bowl. Rub the butter into the flour and sugar mixture until it resembles coarse bread crumbs. Add cold water and mix until a sticky dough forms. Place the dough onto a lightly floured surface. Form into a disc and wrap in cling film. Chill in the fridge for 30 minutes. Preheat the oven to 190 degrees Celsius. Remove the dough from the fridge. Unwrap the dough and roll into a 30 cm circle. Place the rolled-out dough into a 23 cm loose bottom tart tin. Press the dough evenly into the bottom and sides of the tart tin. Trim the dough to the edges of the tart tin. Prick the dough with a fork. Line the dough with baking paper and baking beans and bake for 15 minutes. While the tart case is in the oven, melt the butter in a frying pan. Add the onions and cook until light golden (about 10 minutes). Remove the tart case out of the oven and increase the oven temperature to 200 degrees Celsius. Layer 115g of grated cheese evenly over the tart crust followed by the caramelised onions. Arranged the halved green cherry tomatoes on the top of the caramelised onions. Sprinkle dried thyme, ground pepper, and salt over the tomatoes. Bake for 30 minutes. Remove the tart from the oven and sprinkle the remaining 55g of grated cheese over the top. Return the tart to the oven and bake for another 10 minutes. Remove tart from the oven. Sprinkle the feta and mint leaves over the top. Serve. I mentioned in a recent post that over the last year I have tried various incarnations of the Bakewell tart. It started with me trying a recipe from Marsha’s Baking Addition for Bakewell tart muffins. A delicious combination of light sponge with raspberry jam in the centre, topped with icing and cherry with a not too overpowering almond flavour. 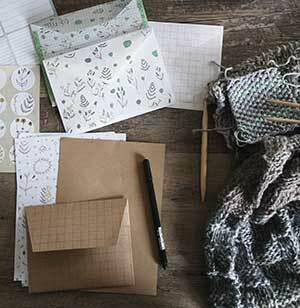 Not only did I enjoy these at home but we also sold them at Lynwood & Co for a period of time. Although they went down well with the customers, they were a bit of a faff to make on a regular basis, given the time restrictions in the kitchen. I knew the Bakewell flavour was popular so my next incarnation of the Bakewell was a Bakewell traybake. I tried an Allrecipe recipe first but although the flavour was good, the rise was not as good as it could have been. If I recall correctly, the cake did not have enough flour/raising agent (sponge was made largely of ground almonds). I wanted to make a traybake with a shortcrust pastry base with jam, almond sponge and icing layers (topped with toasted almonds and glace cherries), so I found a similar recipe to the Allrecipe one but with more flour/raising agent from Marsha’s Baking Addition. The result was excellent and the traybake was very well received at the cafe. So much so that after a few such traybakes at Lynwood & Co, it became so popular that I could not keep up with the bake and I had to go back to the drawing board again. It is not that a Bakewell traybake is difficult in itself, it is just that it is more difficult to make in large quantities i.e. a large single sheet of shortcrust pastry, which needs to be chilled, rolled, chilled, blind baked etc. before completing the rest of the bake. In a larger kitchen with more prep chefs, this would have been possible, but as the main prep chef at the time it proved quite difficult to do when I had the Lynwood signature bakes to complete as well. 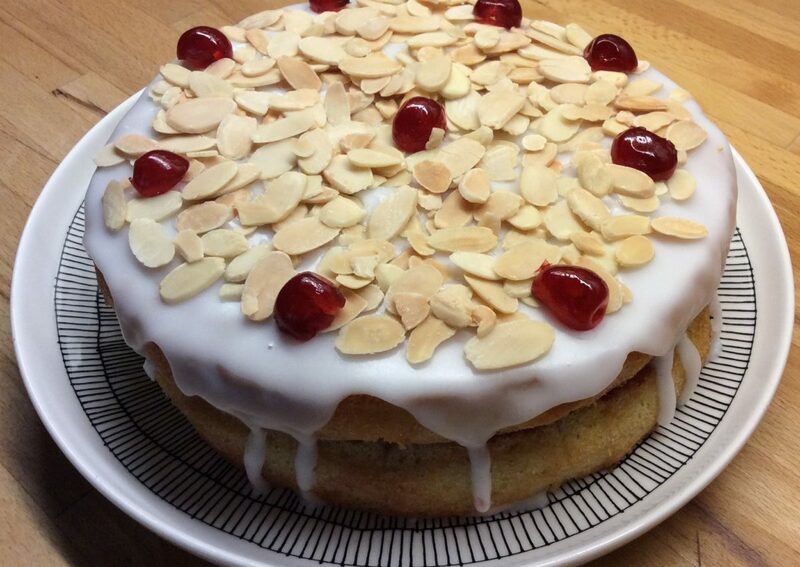 I tried a couple of almond and cherry cakes after the Bakewell traybake and although they were still quite popular, they were never quite as delectable as the first two incarnations of the Bakewell. My last attempt at Bakewell at Lynwood & Co was in March of this year, when I tried Bakewell biscuits. Although my bake resulted in the largest biscuits known to all people kind (okay, a hefty exaggeration) they were very delicious indeed. The only problem with the bake (and a significant one at that) was that they were not too popular with the customers. What we discovered through trial and error is that the preferred choice of biscuit at Lynwood & Co is the triple or quadruple chocolate cookie, which my colleague Shemaine first baked. Not put off entirely, but possibly for some months, my next Bakewell attempt was in August of this year. Armed with a trusty BBC Good Food recipe, I made a cherry Bakewell cake. Two light sponge cakes, separated by a cherry jam layer, topped with icing, toasted flaked almonds and glace cherries. A culinary triumph even if I say so myself (so much so that the image of this bake adorns this post). I am not sure if or when there will be another Bakewell bake, but given the evidence above I am sure that I will give the Bakewell another go in the not too distant future.